Diet trends — from drinking liquid lunches and eating packaged meals to the Mediterranean diet and the keto diet — come and go. In the '90s, dieters gravitated to egg whites, butter substitutes and fat-free cookies, with the rationale being that limiting fat and cholesterol was the key to weight loss and healthy living. But times have changed, and these days various on-trend diets promote eating more healthy fat alongside protein while limiting carbohydrates, particularly of the processed variety (like anything made with white flour or sugar). 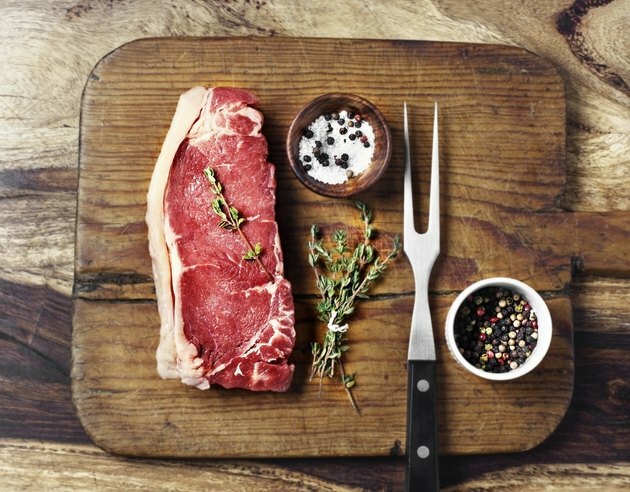 One of the most popular high-protein, high-fat, low-carb diets of the moment? Undeniably, it's the keto diet, which is short for ketogenic diet. The keto diet regimen is far from a new or passing fad. In fact, it was developed in the 1920s as a form of epilepsy treatment by a team of physicians at Johns Hopkins, points out naturopathic doctor Laurie Steelsmith, medical director of Steelsmith Natural Health Center, a state-of-the-art healing center for natural medicine. "The ketogenic diet inverts the triangle of the standard American diet," Dr. Steelsmith notes, referring to the U.S. Department of Agriculture's Food Guide Pyramid, which suggests eating six to 11 servings of grains (breads, rice, cereal, etc.) and fats "sparingly." The science behind the keto diet is surely fascinating and makes a case for the various potential benefits of the regimen. "When carbs are unavailable, as practiced in a ketogenic diet, and our body is crying for fuel for daily mobility, cognitive function and basic metabolic processes, the body starts to break down fat — also known as lipolysis — and utilizes fatty acids and produces 'ketones,'" explains Sharon Zarabi, RD, Bariatric Program director at Lenox Hill Hospital in New York City. When this occurs, your body is considered to be in a metabolic state referred to as ketosis. In this state, the body stops relying on its preferred source of energy, glucose — which is produced by carbs — and instead relies on ketones. Although we may tend to think of any diet as a prescription for weight loss, Dr. Steelsmith says that the keto regimen is particularly helpful for people grappling with a variety of health concerns. Women with polycystic ovarian syndrome (PCOS) — which affects 5 to 10 percent of all women of reproductive age and is associated with infertility, irregular menstrual cycles, cardiovascular risks, insulin resistance and risk of diabetes, according to the Office of Women's Health — are in an especially promising place to benefit from the keto diet, according to Dr. Steelsmith. "It tames insulin levels and encourages hormone balance," she notes. "Women suffering from infertility may also benefit, again for its impact on controlling insulin levels." She also recommends keto to anyone who struggles with calorie-counting or who wants to jump-start weight loss. There's even research to show that it may guard against cancer, thanks to its ability to reduce insulin-like growth factor 1 (IGF-1), a hormone that is important for cell development and that may play a role in the development and progression of cancer. Research has shown that by lowering IGF-1 levels, following a keto diet program may reduce tumor growth and cancer risk over the long term. Dr. Steelsmith also likes the diet as a "viable and effective plan for patients with Type 2 diabetes, thanks to its ability to lower blood sugar levels." In fact, research published in the journal Nutrition & Metabolism found that Type 2 diabetes patients who followed a ketogenic diet lower in carbohydrates saw greater improvements in glycemic control and more frequent medication reduction/elimination than those who followed a low-glycemic index diet. In turn, researchers concluded that "lifestyle modification using low-carbohydrate interventions is effective for improving and reversing Type 2 diabetes." That said, people on medications for Type 2 diabetes and hypertension should work closely with a physician, as a ketogenic diet can quickly change the required dosing of these medications, warns Alexandra Sowa, M.D., a board-certified physician of internal medicine specializing in preventive health, nutrition and obesity medicine in New York City. "Anyone dependent on insulin — in other words, Type 1 diabetics — should not follow this pattern of eating," notes Zarabi. After all, the diet lowers insulin levels. Anyone who struggles with adherence to a long-term protocol or is resistant to meal prep may also not be the best candidate. Zarabi is also concerned about athletes following the plan. "I would be concerned of electrolytes imbalance, vitamin and micronutrient deficiencies and low performance in athletes," she says. "If you participate in moderate to intense cardiovascular exercise it may be difficult to sustain your energy levels, and you may actually need to take in more carbs." It also bears noting that being on the keto diet means contending with certain negative side effects like bad breath, flu-like symptoms (nausea, brain fog and muscle soreness) that can occur for seven to 30 days as the body gets accustomed to the diet, and insomnia and low energy in the beginning, which tends to improve over time. Zarabi notes, "Always consult with a medical provider if you plan on following this diet for an extended period of time, and assess your objective before jumping into anything extreme." Like any other healthy eating regimen, you'll obviously want to see results on the scale, results related to the size of your jeans and results in terms of increased energy, better focus or a bevy of other wellness-bolstering effects. But to ensure you're successfully following a keto diet, you'll want to do a bit of monitoring. 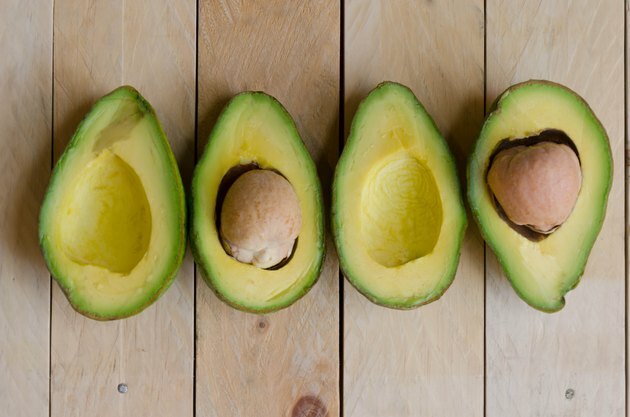 "Checking ketone levels in the blood and urine provide us with a measure of how 'well' our bodies are using fat for energy versus protein or carbohydrates," explains Abigail Rapaport, RD, senior dietitian and ketogenic diet specialist at Mount Sinai Hospital in New York City. "The goal of the diet is to achieve and sustain ketosis while also providing your body with sufficient calories and nutrients." A blood test (like Precision Xtra Glucose & Ketone Monitoring System) that measures acetone and beta-hydroxybutyrate, or BHB, which is the most abundant ketone body in the blood, is the most accurate way to test your state of ketosis. That said, you will have to prick your finger every time you do a ketone reading. If you're not one for pricking your finger every time you want to check your ketones, you can also use urine test strips, which measure a type of ketone called acetoacetate. "Keto urine tests are economical, noninvasive and rather effortless," she says. Still, there's much to be said for simply paying attention to how you feel, and if you're experiencing increased energy, enhanced mental clarity, smoother moods and a bolstered libido, chances are you're succeeding on the plan. Keto Diet Food List: What Are Keto-Friendly Foods? Quality fats (such as walnuts, salmon, avocados and coconut oil), small amounts of clean protein (think darker, fattier types of chicken, steak, pork, etc. ), low-carbohydrate vegetables (leafy greens, asparagus, broccoli, cauliflower), and very few complex carbs (like chickpeas and blueberries) are go-to keto foods. Moderate amounts are allowed, so feel free to reach for that full-fat, (ideally organic) Greek yogurt, cottage cheese, cream cheese, mozzarella or cheddar. Keto Diet Food List: What Foods Should You Steer Clear Of? Pretty much any grain-based, processed food (like pretzels, chips, store-bought cookies or other baked goods) are a no-no. You should also plan to cut out sugar entirely and keep alcohol to a minimum. Although low-glycemic fruits like blackberries are allowed, fruit and fruit juices are off the table. And starchy root vegetables that grow below ground (yams, beets, sweet potatoes, onions, garlic, potatoes) are also disallowed or significantly reduced, as well as condiments like ketchup and maple syrup. If you drink coffee in the morning, consider adding heavy cream or, better yet, MCT oil made from medium-chain triglycerides, fats that behave more like carbohydrates and which spur ketone production. One of the richest sources of MCTs is coconut oil, so you'll also do well to use it to grease a pan, then scramble up protein-rich eggs mixed with leafy greens like spinach and kale, full-fat cheese or avocado, which is packed with heart-healthy, satiating monounsaturated fat. An alternative to eggs: smoked salmon and cream cheese (hold the bagel) or deli meat and cheese. Reaching for a protein-based lunch doesn't have to be boring at all. Dress up an omega-3-rich salmon with spinach leaves, olives, toasted almonds, lemon juice and oil. Or try a different wild-caught fish with a cup of kale tossed with olive oil, avocado, a tablespoon of garbanzo beans, radishes, olives, mushrooms and feta cheese. You can also make a quick deli salad: Mix roughly four to five ounces of canned tuna or chicken salad with two tablespoons of full-fat mayonnaise, a quarter-cup of chopped celery, a quarter-cup of chopped carrots, a dash of mustard and salt and black pepper to taste and serve over one cup of romaine lettuce. 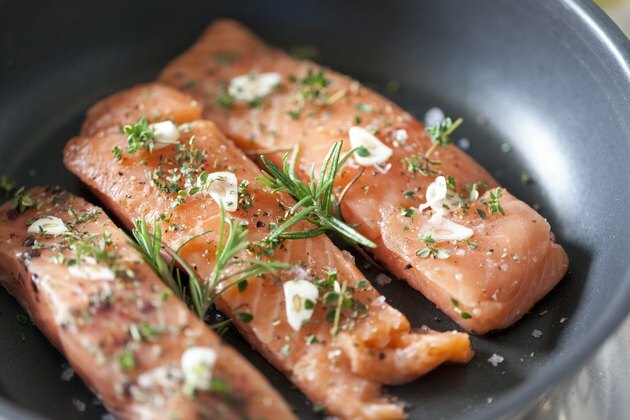 Good choices for dinner are chicken (ideally fattier dark meat like thighs), fatty fish (like mackerel or salmon) or steak (think fattier cuts like ribeye) cooked in about a tablespoon of coconut or olive oil and wrapped in lettuce with avocado, sprinkled with Parmesan cheese and any spice. Another way to prep: Serve your protein of choice alongside steamed, low-carb vegetables (asparagus, broccoli, eggplant). Pairing a low-carb veggie with a high-fat spread can make for an easy-to-grab, satiating snack. You might try celery and almond butter or guacamole with cucumbers. You can also reach for nuts (like 10 to 12 macadamias, which boast high stores of monounsaturated fats), a slice of full-fat cheese or some jerky. For a snack that satisfies a sweet tooth, Dr. Steelsmith likes this low-sugar fruit parfait: Pair one to two teaspoons of blackberries, raspberries or strawberries with a half-cup of coconut cream or full-fat plain yogurt and a handful of chia seeds, which are packed with healthy omega-3 fats.